Over the last few years, Seiko has made a habit of releasing limited editions with exceptional enamel dials at very reasonable prices. 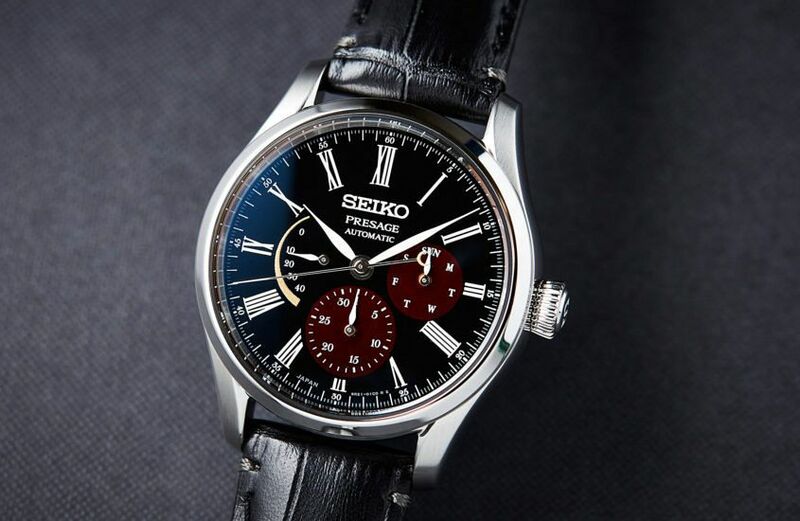 First, there was the Moonlit Night, then the Shippo enamel, and now, the Urushi Byakudan-nuri. 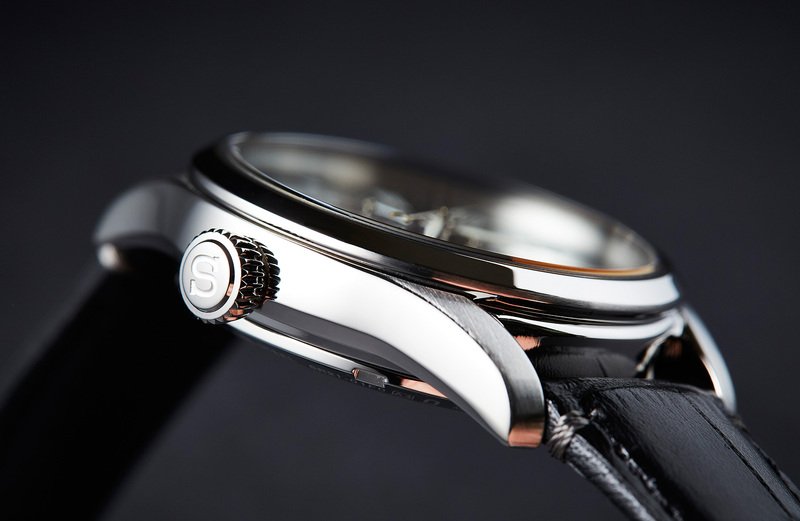 The vehicle for these delicate, incredible dials is the Presage collection. A classic round steel watch that marries dependability with dressability. 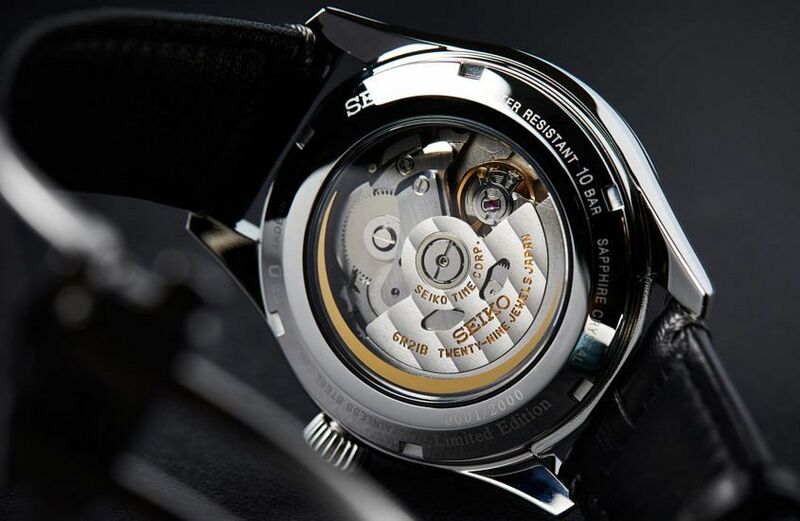 But really, this 40.5mm case, and the 6R21 movement behind it are known quantities, and not what we’re here for. Honestly, we’re here for the dial. 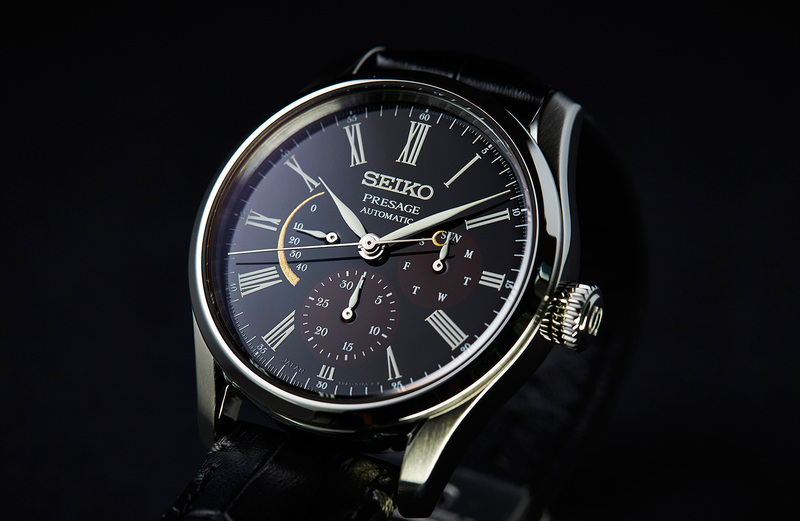 As is common with Seiko’s watches, especially the special, limited ones, there’s a story to this dial. It has been designed to evoke the look of the night sky just before dawn. This narrative goes a long way to explaining the unusual colour palette of the Byakudan-nuri. The base of the dial is made using the traditional Urushi technique we’ve seen on other limited edition Presage models. Here though, it’s jet black. 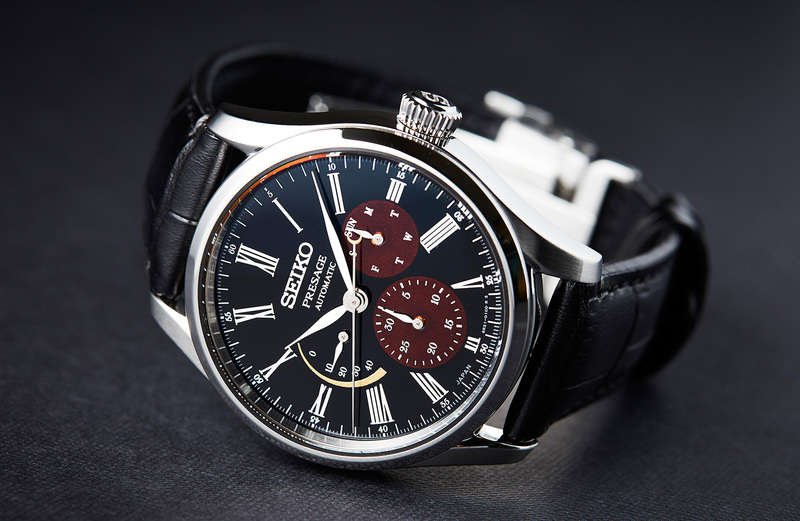 The calendar subdials, crafted through the Byakudan-nuri technique, are in a deep, rich red, achieved with a careful sprinkling of fine metallic powder. Though the red is quite dark, it’s anything but dull, thanks to the way it plays in the light. This red can be seen as akin to that thin line of light on the horizon visible in the minutes before dawn. 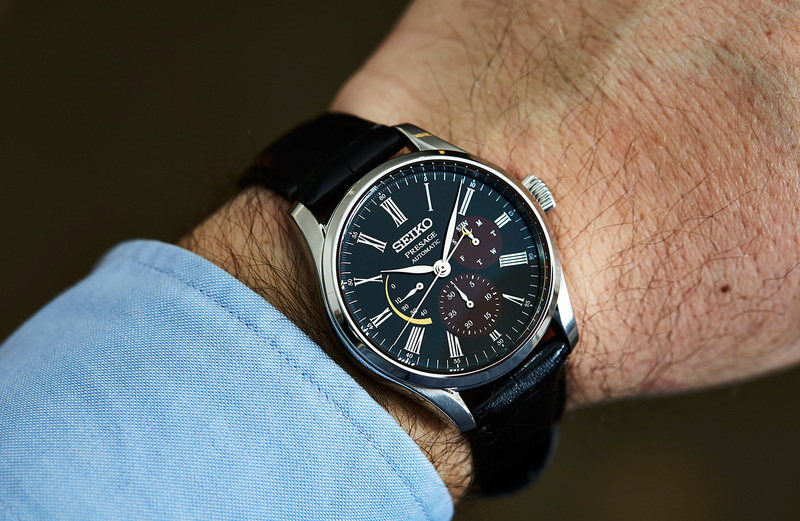 Finally, there’s the representation of the moon, which takes the functional form of the power reserve indicator. To create this glittering crescent, the craftspeople in Urushi master Isshu Tamura’s studio use a technique called Maki-e, where layers of Urushi lacquer operate as an adhesive to which a gilt powder is applied; the excess is gently tapped off and then finished to give it a rich granular texture. 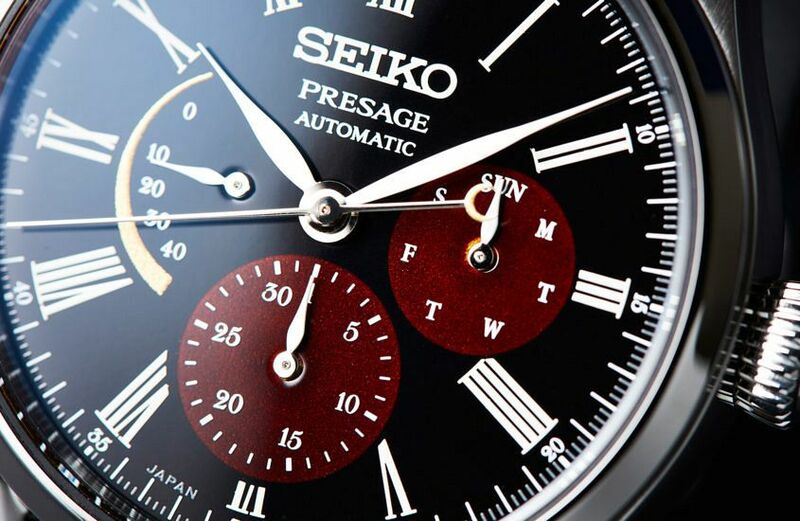 Of all the Seiko Urushi dials, this is simultaneously the boldest, and the most subtle. It’s also (I suspect) the most complicated, due to the number of additional processes involved in creating this multi-coloured, multi-textured beauty. It’s simply outstanding. 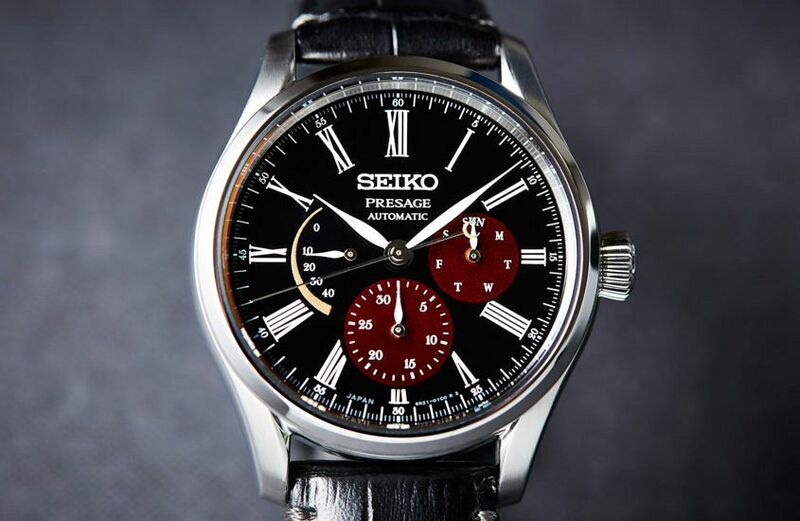 Seiko Presage Urushi Byakudan-nuri Limited Edition, limited to 2000 pieces, $3400. Time+Tide will have a limited allocation available for sale from 12:00PM tomorrow.